Although this isn't used actively in the creation of new FileMaker databases, you certainly may come across it if you open a FileMaker database that has been in use since pre-FileMaker 7 days. In this example, we have built a relationship that points back to itself, normally called a self relationship. We have created a calculation field that is always equal to 1. Then we used this field as both the parent and child key. 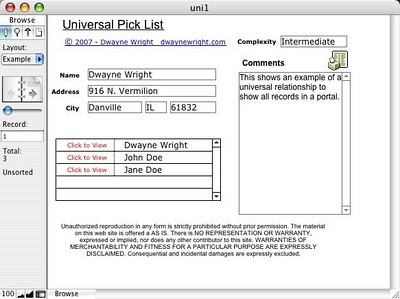 The result was a portal using this relationship showing all the records in the database. So it’s like a mini rolodex. We included a button in the portal that goes to the record in the portal. Now, the technique of using a calculation field always equal to one isn’t used that much anymore. For a universal or constant relationship in FileMaker 6, you would have to create a parent and child calculation field that would always equal the same value. In most cases, it would be a calculation field that always equaled 1. If you convert your FileMaker 6 database system to FileMaker 7 and higher, this will still work. FileMaker conversion will not automatically update this relationship to the more elegant comparison operator design. You will need to do that manually.